Miss Posh Life™: Posh Beauty: Butter London NYE Nails! Posh Beauty: Butter London NYE Nails! It's NYE poshinistas which means--time to get posh! I love any reason to dress up. I have some pretty fabulous plans for tonight...a secret supper at a dynamic location. I was so inspired by the night ahead that I decided to try new nails. I'm calling them my version of tuxedo nails. The look is very simple to replicate and took about 5 minutes more than a normal nail polish application. Tools required are: base coat, topcoat, two complimentary nail colors and a basic makeup sponge. Apply Base Color (Union Jack Black). Allow to dry enough so that it is touchable but still tacky. Sponge "Top Base" color on the nail. 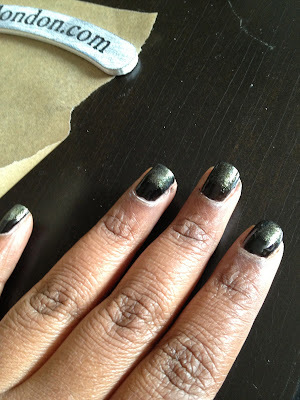 Keep sponging until you get color intensity you like but lightly enough to allow the base coat to show through. Apply topcoat over entire nail.